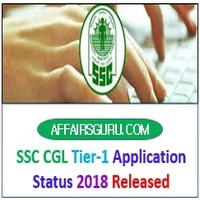 Even during finalisation of the SSC vendor, Staff Selection Commission (SSC) has finally released the SSC CGL Tier 1 Application Status for year 2018. Candidates who had applied application form can check their application status region wise. There is just need to enter your name/ registration or roll number and date of birth (DOB) and know the status of your application. Application status for all the region will be released soon. We will continue to upload the link to check your SSC CGL Application Status 2018. Be tuned with this article to know further notice of the releasing the application status for specific region. SSC (Commission) has uploaded the CGL Tier-1 Application status 2018 – 19 for Southern Region (SR) includes Andhra Pradesh, Puducherry and Tamilnadu. Check Now your application status for the year 2018-19. SSC (Commission) has uploaded the CGL Tier-1 Application status 2018 for Eastern Region (ER) includes West Bengal, Jharkhand and Tamilnadu. Check Now your application status for the year 2018-19. SSC (Commission) has uploaded the CGL Tier-1 Application status 2018 for Kerala Karnataka Region (KKR) includes Kerala and Karnataka. Check Now your application status for the year 2018-19. SSC (Commission) has uploaded the CGL Tier-1 Application status 2018 for North Eastern Region (NER) includes Assam, Arunachal Pradesh, Meghalaya, Manipur, Tripura, Mizoram and Nagaland. Check Now your application status for the year 2018-19. SSC (Commission) has uploaded the CGL Tier-1 Application status 2018 for North Region (NR) includes Delhi, Rajasthan and Uttarakhand. Check Now your application status for the year 2018-19. SSC (Commission) has uploaded the CGL Tier-1 Application status 2018 for North Western Region (NWR) includes Haryana, Jammu & Kashmir, Punjab and Himachal Pradesh. Check Now your application status for the year 2018-19. SSC (Commission) has uploaded the CGL Tier-1 Application status 2018 for Central Region (NER) includes Uttar Pradesh and Bihar. Check Now your application status for the year 2018-19. SSC (Commission) has uploaded the CGL Tier-1 Application status 2018 for Madhya Pradesh Region (NER) includes Madhya Pradesh and Chhatisgarh. Check Now your application status for the year 2018-19. SSC (Commission) has uploaded the CGL Tier-1 Application status 2018 for Western Region (WR) includes Maharashtra, Gujarat and Goa. Check Now your application status for the year 2018-19. 1 : Click on any one of link of your specific region. 2 : Enter your Name/ Registration or Roll Number and Date of Birth in the given input box. 3 : Now click on “Know your roll number and status of application”. 4 : Find the details and ensure it is that about you. Check the application status by given details. 5 : Alternatively visit to the regional website as per the filled zone (preferable exam centre). 6 : Check the link of SSC CGL Tier-1 Application status there in notice. 7 : Follow the steps from 2 to 4. SSC has not still announced the exam date for SSC CGL Tier-1 exam. We will inform on this article once getting the notice from commission. Our AffairsGuru Team will continue to update the link as soon as releasing the further SSC notice.